(CNN) – Gov. Chris Christie stopped by Facebook’s headquarters in Menlo Park, California, where he spoke with employees and also did a live chat for about an hour Friday night. The governor’s blunt style came across on a computer screen just as well as it does on camera. “Is there a way to impeach yourself?” one person asked. 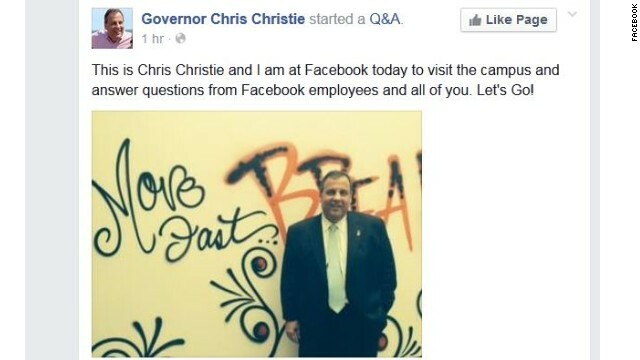 “Unfortunately for you, no,” Christie responded. The New Jersey Republican has long had a relationship with Facebook co-founder Mark Zuckerberg, who appeared with the governor and then-Newark Mayor Cory Booker on Oprah Winfrey’s show in 2010 to announce a $100 million donation toward improving schools in the city. Zuckerberg, a billionaire who has had an increasing role in politics, also hosted a fundraiser for Christie's 2013 re-election bid at his home in Palo Alto, California. It's also worth noting that another potential GOP presidential contender, Sen. Rand Paul of Kentucky, stopped by Silicon Valley last year, with visits to Facebook, Google and eBay. He did a similar online chat at Google. Christie’s Facebook visit is part of a weekend-long West Coast swing, with an itinerary that included several fundraisers for the Republican Governors Association in San Francisco and a stop by a local business with California gubernatorial nominee Neel Kashkari. Friday night he heads to Park City, Utah, where he will attend another RGA fundraiser ahead of Mitt Romney's annual retreat on Saturday. In his Facebook chat, users submitted close to 400 questions and comments. In the first hour, he was encouraged to run for president 11 times and was complimented about his appearance three times. Others submitted complaints or questions about local issues in New Jersey, making the chat feel similar to his frequent town hall meetings. Q: Is there a way to impeach yourself? Q: Is this the place to chat with the man? Q: Do you really think you have a chance? In my mind you are a disgrace to American politics. Q: Who is your dream all time republican presidential ticket? Q: I like the way you shake your booty, please run against Hillary, she scares me! Love you! Q: What are your ties to organized crime? A: Yes it does. But, if you want to be in this business you have to learn to deal with it. Q: Who is your favorite Jersey Shore character and why? Q: I liked your dance on Jimmy Fallen tonight show You do have some moves. Any cool moves you want to make for NJ. I would like to see some improvement in the State drug court system.. like more support for recovering family that have loved ones in drug court. any ideas on that Governer? Q: I am a veteran, NJ medical marijuana patient, and a student currently in my senior year at NJIT. I am pursing (sic) a bachelor’s degree in electrical engineering. Recently, I was denied an internship on grounds of being a medical marijuana patient. My question is do you agree NJ should discriminate me for my medical treatment? I have tried all other avenues of treatment and nothing else works, so is my degree worthless in NJ? I served my country proudly and can’t believe I am being discriminated. Would you support protecting medical marijuana patients from this type of discrimination? Q: Is there a place we can buy the "Governor" fleeces? Q: When will you come on down to Collingswood to fight me? I'm not afraid of you. You're all talk. Q: What will you do to protect our borders; particularly in the South. Also, how would you handle what is happening right now with all the people crossing and turning themselves in. Thank you. Q: How do you interpret Cantor's loss in Virginia? What do you think the people are trying to say? Q: Gov, do u regret calling Israeli settlements in the West Bank Occupied territories? Do u think that by u not mentioning Israel in a recent Jewish event speech will have an effect on getting the Jewish vote if u decide to run for president? Q: If the budget predictions were so off resulting in your not having enough money to make your promised pension payments, why do you continue to give huge tax breaks to developers and other big corporations for minimal returns/benefits to our economy? Q: How do you pronounce "rino" in New Jersey? 1) You cant win in 2016 in NJ; what possibly makes you think you could win in Ohio, Pennsylvania, Missouri, Indiana, West Virginia, North Carolina AND Florida . . . all of which you need to beat Hillary? 2.) You haven`t managed NJ`s finances well. How are you going to spin that into the traditional "Republicans are fiscally responsible"? Mr. Obama is shrinking the deficit in a sustained manneR and you are blowing NJ`s credit rating. What do you get when jump off a bridge ? a belly pain . gfys . Who cares? CNN, you do know that bridge gate is not going away, right? This bully will get his just desserts and he will eat all of it. chris christie is going to mop the floor with hillary clinton. the guy can give it as well as take it. we need somebody like that. mccain and romney were just too damn nice and refused to rumble when that is what was needed. in a fight, sometimes you need to come in close and deliver those body blows. christie is perfectly suited for that.